Want to convert more leads into paying customers? Want to save time and avoid entering in data manually? Here are 3 zaps you can use with Daylite to help you do just that. Using a contact form on your website is a great way to get interested leads to engage with you so you can start the process of turning them into happy customers. Whether the contact form is used to get a quote or just to just to start a conversation about your services or products, website forms make it easy for leads to reach out so you can start the sales process. Instead of having the lead from your website form come into your inbox where you manually create a new person, company, and Opportunity, you can automate this with Zapier. As soon as someone fills out the contact form on your website, that lead is created as a new person, company, and Opportunity in Daylite. This way you save time, don’t have to worry about manually entering in data, and you have a list of active leads to follow-up with. Plus the time you save means more time to turn leads into customers! Integrate JotForm and Daylite by using Zapier to pull leads from your website in JotForm right into Daylite. 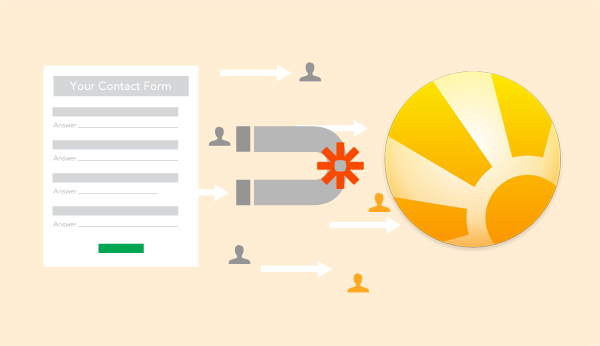 Integrate Google Forms and Daylite through Zapier to automate creating a new Opportunity in Daylite when someone fills out a form on your website. Integrate 123ContactForm and Daylite by using Zapier to pull leads from your website in 123ContactForm into Daylite as new contacts and Opportunities. Want to take advantage of Zapier? Want to pull leads from your website right into Daylite so you can start winning more business? Read this help article How To Use Zapier to Import Web Leads Into Daylite and start using Zapier today. Zapier integration is Exclusive to Daylite Cloud. To take advantage of this feature and ditch your server, contact us about Going Cloud.